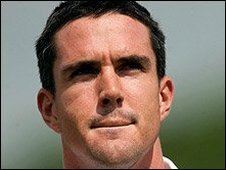 A teenage cricketer is recovering after being floored by a drive from England batsman Kevin Pietersen during a practice session in Leicestershire. Schoolboy Reece Topley, 15, who attends the Royal Hospital School in Holbrook, Suffolk, was hit on the ear and knocked to the ground by Pietersen's shot. The youngster had been bowling at Pietersen when the England cricketer hit a drive straight back at him. Reece needed stitches. Pietersen left a signed bat for him. Reece, an emerging talent, had been invited to bowl at the England batsmen at Loughborough University, as part of the team's preparations for the ICC World Twenty20 competition. The teenager's father, Don, 45, a former Essex cricketer, said: "Certainly there was a bit of pain and a bit of shock but it could've been a lot worse." Mr Topley said his son, who had a "few" stitches inserted into his wound on Monday night, remained at the Leicester Royal Infirmary Hospital and was undergoing tests. He said: "In a light-hearted moment last night in the hospital, I did suggest to Reece that he might have dropped a catch - to which he replied: 'I think I stopped it going for six." He added that Pietersen had been concerned about the injury and had left a signed bat for Reece to collect at the university. "Kevin Pietersen has always been Reece's favourite cricketer, I'm sure that will remain the case if Reece gets this bat."